Kazi Kwa Vijana; politically speaking. First off I highly condem any action that would rob struggling Kenyans of an opportunity to better their standards of living. Youth unemployment levels are in stiff competion with inflation and comodities prizes as if to see how high they have to be to break our hopes. The Kazi kwa Vijana (KKV) scam is exactly the kind of ammunition that would tear through the flesh of Raila Odingas presidential ambitions. But it is not the first time he has had to face such a threat. The Triton Oil and the Maize scandals were both like the highly efficient Sierra Diamond Line Molly Sierra 168gr HPBT bullets in the hands of a skilled sniper. 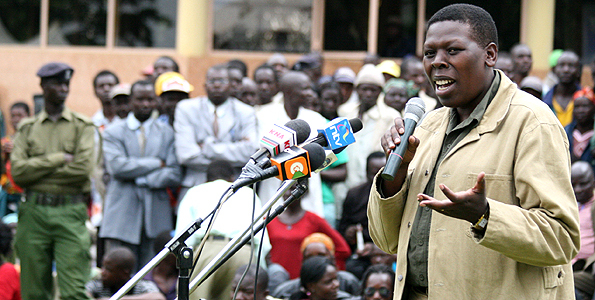 He however survived these for a number of reasons; he had the canopy of an armoured vehicle in the form of support from ODM MPs and the reformer outlook he enjoyed, and he also had a high end Kevlar jacket (bullet proof) in the form of his populist approach to politics that ensured he enjoyed support of the masses and his own charismatic statesman approach in dealing with allegations as he never openly projected the blame to the next person. This time round, with KKV as the new ammo, both his strong points seem to be gravely compromised. His opponents have been diligent in their efforts to insert flaws in the masterpiece he created over decades in Kenyan politics that portray him as a reformer. Could it be possible that they finally found the perfect solvent for the paint job? For a snipers bullet to penetrate the body armour of its target or even cause damage to it, there has to be a clear line of sight – the armoured vehicle has to be dealt with first. Slowly by slowly, the numbers of leaders who have been standing in solidarity with the PM in times of need has been waning and at the moment, his heavyweight support seem to be otherwise engaged; Charity Ngilu with troubles she blames on the VP Kalonzo Musyoka, Balala is left to battle Mombasa supremacy battle against Njoho after failing to secure the unelective Coastal peoples spokesmanship which seem to favour Makwere who is both Mijikenda and Muslim, and last but most important Musalia Mudavadi who is facing increased pressure from his community to be his own man and run for the top job come 2012. The likes of youthful-Eugene Wamalwa, serious-Cyrus Jirongo and the recently controversially reinstated foreign affairs minister Moses Wetangula are putting Mudavadi to exam causing the traditional swing vote constituency to abandon their satisfaction with king-making and support nothing less than an overall Omwami. With this in mind, Mudavadi’s tactics have to be more ambitious. He needs the nation wide appeal that ODM provides while at the same time nothing short of a run for State House would suffice in cementing his back yard support. This in essence makes him the PMs top opponent. In the Kazi kwa Vijana issue, the PM has adequtely refuted claims that such a scam exists. What this means is that can not take “individual ministerial responsibility”. Or what we characterize as “political responsibility” as Joe Adama explains (see link below). If Mr.Odinga fails to provide a strong argument for his case during the Prime Miniters time in Parliament, it will be the proverbial hot iron awaiting to be struck and it would be interesting to see what how the ODM number two Mudavadi will react. This would certainly be his strongest moment, when the ‘flow is at the tide’ . If he chooses to join the “Political responsibility” band wagon, it would be to the delight of the ‘snippers’ and his image as a loyal partner goes out the window together with support from ODM as a national party. He will be left without a what-next-plan that will leave his western Kenya counterparts parading his name as an example of a spineless leader. 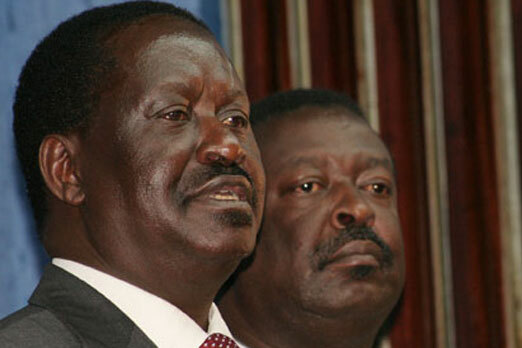 Another option would be an offer from Raila as he strategises his own political survival. Now this is not only speculative but highly hyperthetical but bare with me for a minute. With every recent presidential polling indicating a run-off in the next election, Mr. Odinga may well have to consider employing some melodrama that will either get his direct vote above 51% or give weight to his endorsement of a different ODM flag bearer as, in a “Putin-Medvedev” fashion, he becomes the running mate. In such a scenario the PM would have to concede that there was indeed a scam going own right under his nose and maybe even go further to expose some unknown facts since he “has nothing to hide”. He would then resign from office in the spirit of being a pace setter and practising what he preaches. A loyal Mudavadi would be expected to facilitate and advocated for a swift investigation into the matter as the highest ranking ODM MP in government as Deputy Prime Minister (or even Acting PM-if the law allows). Given that so far no one has alleged that the PM is directly involved in stealing, it is likely that any investigations will vindicate him. Opinion polls over the following 3-4-5 months would then take centre stage in informing Mr. Odinga’s next move. Candidate through a “party nomination” exercise and settle for a running-mate position. His below 51% support will be more useful in this way and it would catch his ‘raila-holic’ competition unaware. If the polls indicate a decline in support at that stage, the same strategy would be all the more suited since the drop would be a result of the publics opinion of him as an individual and not necessarily the ODM party as a whole. A change of guard would only go to strengthen the party further. He would also dispel the long-standing accusations made by disgruntled MPs from Rift Valley that he is a dictator. Finaly in the very unlikely scenario that poles indicate that his rating have increased, it would be a new lease of life the man Raila Odinga. He will feel buoyed enough to go the full race for State House with somewhat lesser fear for a run-off complicating things. He would have the initial option of a running mate in Mudavadi. In the event a different hopeful with the ability to deliver more as a running mate comes along, Mudavadi would be free to pursue his presidential ambitions in a different ODM-friendly party which would enable him to neutralise the threats posed by Eugene, Cyrus and Moses at his own backyard and provide a contingency backing for Raila incase there would still be a run-off after all.